When I heard that the North Carolina Symphony was putting on Symphonic Mashup: The Music of Radiohead Meets Brahms, I knew that I had to be there. A fan of all genres of music, this sounded like an awesome concert for me to take in. And I was not alone in that thinking. I was among many Music Maniacs who took in this North Carolina Symphony Special Event at the Duke Energy Center for the Performing Arts (2 E. South St., downtown Raleigh). Whether you&apos;re an art rocker or a classical music aficionado, or both, you woulda&apos; loved this event. The Special Event: First of all, North Carolina Symphony wonderfully planned the opening act. Musicians Ari Picker and Emma Nadeau, of the band Lost in the Trees, opened the concert with calm, yet emotionally intense original music. The band proved to the audience that there is an abundance of undeniable musical talent surrounding the area. Check Lost in the Trees out at Hopscotch Music Festival 2013! So to see and hear the North Carolina Symphony not only beautifully and elegantly play orchestrations by Brahms but also rock tunes off of Radiohead&apos;s OK Computer, and then on top of that, to hear them played both together, was truly a stellar experience. The mashup was actually created and arranged by composer, conductor, arranger and producer Steve Hackman. North Carolina Symphony vice president Martin Sher had prevously worked with Hackman, and so this helped sparked the idea of bringing Hackman&apos;s musical creation to Greater Raleigh. So the event came and so did the Music Maniacs. Appropriately, Hackman conducted the North Carolina Symphony and the three vocalists who sang the lyrics and melodies of the Radiohead songs. (Another cool tidbit is that the three professional vocalists have all worked with Hackman tremendously on performances of the mashup previously, so the vocals were seasoned to perfection.) Radiohead and Brahms have both elegant and chaotic sounds in their compositions, so hearing them together flowed very naturally. The performance included Radiohead songs "Paranoid Android," "Karma Police," "Subterranean Homesick Alien" (my favorite track on that album) and more. 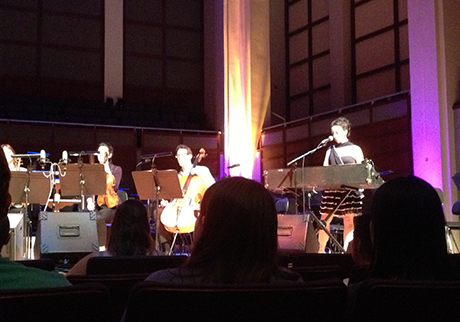 When the performance kicked off with a beautifully done rendition of "Airbag," I knew I was in for a treat. Check out Hackman&apos;s description of the mashup and the song list here. Listening to the music was, hands down, like being on an intense roller coaster ride, but you still had enough chances to get lost and absorb the moment. At times, listening to the audience was entertaining as well. The crowd was clearly having a great time. At one point after a song, and in the dead of silence, an audience member yelled out, "Yeah!" Hackman paused, looked back and replied with delight and a smile, "Yeah?" The audience laughed, clapped and without words said, "We&apos;re absolutely loving this and you all are putting on an amazing performance!" This event in particular was only the beginning of North Carolina&apos;s Symphony event schedule for the summer! So you&apos;ll have more chances to see the symphony go beyond the bounds of traditional classical music this season. The Venue: Duke Energy Center for the Performing Arts continues to prove that it&apos;s one of the hottest venues for live music in North Carolina. The architecture of the exterior itself lends you the realization that world-class concerts happen inside of the venue. Check out the photo below. I always jump on the opportunity to take some photos of this intriguing building. 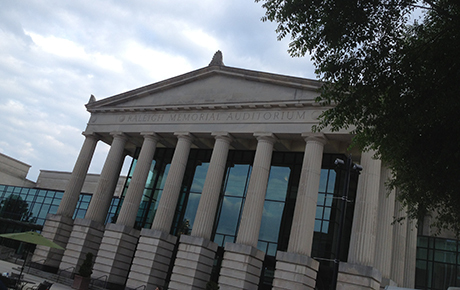 The venues inside of the building include the Memorial Auditorium, Meymandi Concert Hall, A.J. Fletcher Opera Theater and Kennedy Theatre. Meymandi Concert Hall, where this mashup concert took place, helped set the mood for the performance. This remarkable venue boasts 1,700 very comfortable seats. And the 65-ft. ceiling, shoebox shape, overall design and warm, clear sound system all worked together to give the Radiohead and Brahms mashup the absolute best sound possible. 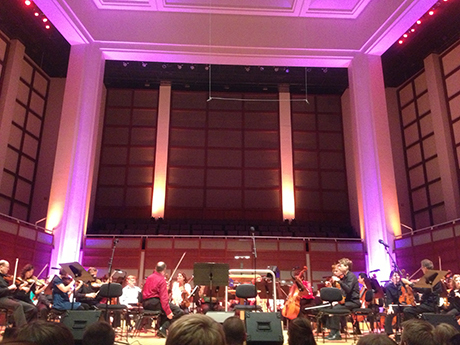 You&apos;ve got to experience the acoustics at a concert when you&apos;re in Greater Raleigh! Also, the lighting fueled the emotions of the pieces of music, with warm blues and purples, intense oranges and greens and more. The Musicians in the Symphony: I couldn&apos;t leave out a mention of the musicians in the North Carolina Symphony! As I was sitting, watching the musicians in the orchestra, I couldn&apos;t help but notice the way they mingled with each other and talked, looking enthusiastic and thrilled about playing together. At this show in particular, the orchestra casually made their way to their seats, warming up and mingling before the show started. Seeing the positivity on stage just made the night even better. I think it goes without saying at this point that the talent of the musicians is phenomenal. The musical quality was top-notch, proving once again that the North Carolina Symphony is a symphony every Music Maniac would enjoy seeing. The Events Surrounding the Event: North Carolina Symphony adds some really cool touches to its Special Events that make the events even more unique and "special." At Symphonic Mashup: The Music of Radiohead Meets Brahms, the North Carolina Symphony invited food trucks to set up in front of the Duke Energy Center for the Performing Arts in the scenic plaza. Lots of concert-goers were hanging out, dining and mingling before the show, getting pumped for the performance. The venue also offered local craft beers, and you could have a delicious ale while watching the show! On Friday, June 7, for the symphony&apos;s Video Games Live event, there will be a huge before-the-show Guitar Hero competition. The winner will get to compete on stage! At the Sci-Fi Spectacular event on Thurs., June 27, and Fri., June 28, George Takei, "Mr. Sulu," of Star Trek will be in Greater Raleigh to narrate your journey through the galaxy, live, accompanied by music from E.T., Star Wars, Close Encounters of the Third Kind and, of course, Star Trek. A must-see for Trekkies! As Greater Raleigh has the most live music of any destination in N.C., you know there are more North Carolina Symphony Special Events coming up this summer! On Sat., June 8, the North Carolina Symphony will head to Koka Booth Amphitheatre for its Summerfest Series Classical Mystery Tour concert. 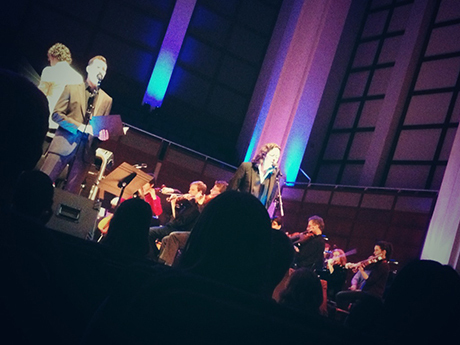 The orchestra is going kick out The Beatles tunes such as "Eleanor Rigby," "Penny Lane," "Yesterday" and much more. 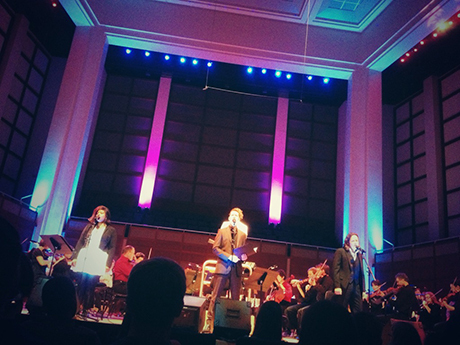 This concert celebrates the 45th anniversary of the release of The Beatles&apos; White Album. Get some sun and feel the awesome N.C. summer weather while you listen to music from one of the greatest bands in history. Don&apos;t miss the Jerry Garcia Symphonic Celebration featuring Warren Haynes on Thurs., June 20. Greater Raleigh is the only spot in the Southeast where this tour will stop! This ground-breaking orchestral adventure will feature Garcia&apos;s original compositions and classical interpretations of timeless standards that were hallmarks of Garcia and the Grateful Dead&apos;s concerts. A blend of Warren Haynes&apos;s critically-acclaimed guitar playing, the sounds of the North Carolina Symphony and the music of Jerry Garcia is sure to have Music Maniacs talking. Click here for a complete calendar that lists every live music event in Greater Raleigh this summer!